Part 1 of 3 in a series of articles that explore Eve’s design process as she developed her “Sacred Geometries” series. “He was perfect. As Leonardo Da Vinci drew him, he was the poster boy, the icon, for all that was right with creation. His proportions, mathematically correct, his position, splayed equally between circle and square, (between heaven and earth), This Vitruvian man was know to all, and his example followed by all artists and architects since Plato. Eve talks about dreaming of the shapes that she envisions. Once it is put on paper she has fully formed the idea in her imagination. Her newest series “Sacred Geometries” has been in her imagination for several years. She reads a lot about history and creation and the origins of civilization. From her years in archaeological sites, she retains a belief that humans seek not only food and shelter, but also a measure of transcendence, to give life a meaning. Alfillé was schooled in the classics, Latin and Greek, but notes that her archaeological work took her to other civilizations, and spurred her interest in common symbols to all cultures. She has another view on Vitruvian Man. “But things change… New continents explored, new ideas and art have moved on. Vitruvian man has lost his job. And… he’s exhausted hanging there for so long. He’s out of here, he steps out, and in this piece I have created in gold and gems as a belated homage to the power of ideas” states Eve. More notes on the design include… He is an outline, but with some depth, 3-D, suggestion of musculature, face is blank. 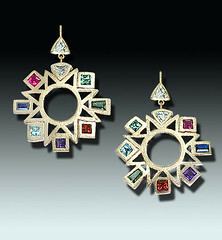 In her studio she experiments with these ideas and develops her images into yellow and white gold, then embellishes them with diamonds, sapphires and green irradiated diamonds. Finally, he comes to life in her “Icon Suspended” pendant, which is gleaming with 18K white and yellow gold. 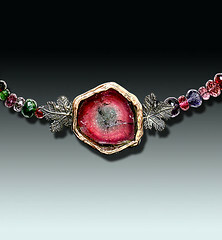 Rubies, rose-cut diamonds, sapphires, green irradiated diamond. “The Circle in the Square” In almost every civilization, the circle is taken to represent heaven, where the square denotes the built environment i.e. earth. Just as in the Vitruvian man drawing, Da Vinci depicted man suspended between heaven and earth. 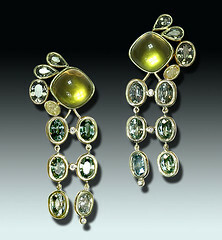 “In these earrings, I wanted to show that each one of us potentially carries a piece of heaven within us,” states Eve. Previous postLes perles précieuses de la reine de France font vendues!